La Costa Blanca is equipped with a modern communications network that makes it accessible from anywhere in the world. Road transport: a complete motorway network (AP-7) and the national road N-332 connect the towns and cities of La Costa Blanca with the main Spanish and European cities and areas. EUROMET, one of the most modern and fastest trains, travelling at a speed of more than 220 km/hour, connects Alicante to Valencia and Barcelona. RENFE, the railway transport services company, is another option for travelling between the different towns and cities (information and tickets by calling 902 24 02 02 - RENFE Line). Railway transport is expected to improve its services with the arrival of the AVE in Alicante by 2012, as announced by the Ministry of Development. Air transport is firmly established in La Costa Blanca and the Autonomous Community of Valencia with Alicante's 'EL Altet' international airport, offering a large number of operators, including many low-cost companies, car hire services, taxis, etc., and Valencia's 'Manises' international airport. To obtain detailed information on the airports of Alicante and Valencia, please visit the AENA website (Spanish Airports and Air Transport). Sea transport in La Costa Blanca is available in Alicante, whose port has become one of the main Mediterranean ports for cruise liners. 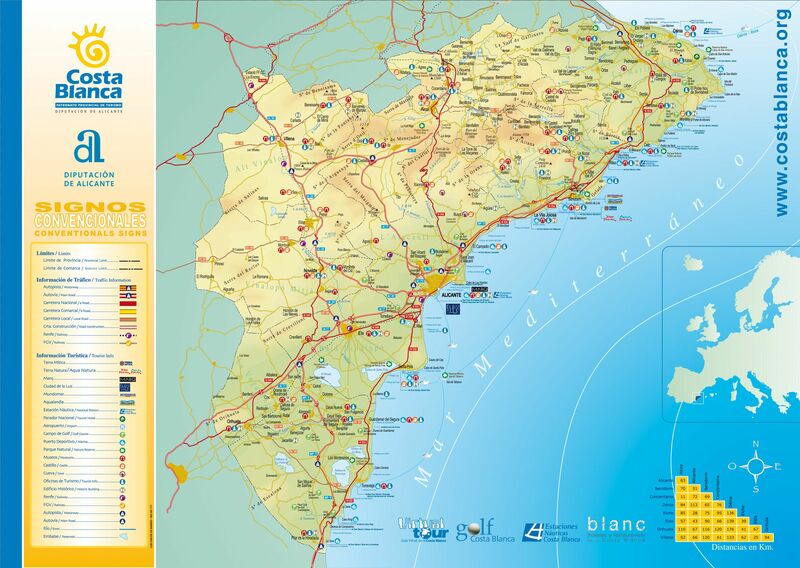 Denia's port also offers ferry crossings to the Balearic Islands, with various shipping companies providing regular crossings.Distances from Cumbre del Sol (Poble Nou de Benitachell) to the main cities of La Costa Blanca and the Autonomous Community of Valencia. - 'El Altet' airport in Alicante: 82.10 kilometres. - 'Manises' airport in Valencia: 130.90 kilometres.